Are you facing a challenge or a difficult problem? The prayer to the Holy Spirit can help you handle it with grace. 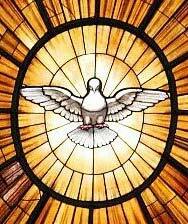 When Jesus told the apostles at the Last Supper that the Holy Spirit (pictured at left as He is often symbolized, as a dove) would instruct them in His Word and be their advocate and comforter, He meant for His Spirit to help us as well. 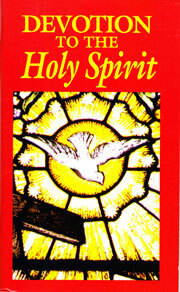 The prayer to the Holy Spirit is also called Come Holy Spirit (or Come Holy Ghost, another name for the Holy Spirit) in some prayer books and websites. Its verse and response lines make this a wonderful addition to any set of group prayers. You can pray it alone as well. The verse and response lines are taken from Psalm 104:30 (Psalm 103 in some older versions of the Bible) describing God’s sending forth His Spirit as He creates “all that is seen and unseen,” as we pray in the Nicene Creed. The reference to fire brings to mind the Holy Spirit’s essential role in the creation not only of the world, (“moving about the face of the waters,” from Genesis 1:2) but also of the Church as well! We read in the Acts of the Apostles how the Holy Spirit came as “tongues as of fire” (Acts 2:3) enlightening the disciples to spread God’s Word with power and love. When you’re “on fire” about something, aren’t you passionate about it? We are called to be that way in expressing our love for God’s truth in how we live and spread our Faith! We see how being “truly wise” (as in the first example of the prayer to the Holy Spirit above) allows us to “relish what is right” (as in the second example)! It’s important in this regard for us to try to graspGod’s meaning of wisdom and righteousness, however. As St. Paul put it “the wisdom of the world is foolishness to God” (1 Cor 3:19). Valuing power, prestige, and possessions above everything and everyone else, with little or no thoughts for God and His desires for us is indeed foolish. As our Lord said once, it is like building a house on a foundation of sand (Matt 7: 26). We can’t equate status with wisdom. Do you know people who are very clever, full of worldly wisdom, and yet are duplicitous? You can’t really trust them but they’re “good at politics.” (You might think of these people in less than Christian language!) Perhaps you’ve been like that on occasion! • By receiving His guidance in the sacraments of the Eucharist (at Mass) and of Penance (in Confession) to serve others and show them His love. We see here from the two versions of this prayer to the Holy Spirit how being truly wise means relishing what God thinks is right, including “patience, kindness, generosity, faithfulness [and] self-control,” as St. Paul wrote in his letter to the Galatians (Gal 5:5). The implication of this is quite beautiful: If you’re living in this world focused on Eternal Life with God in the next, and are sincerely seeking to do His will, in good times and bad, you will be blessed with the consolation of His great comforter: the Holy Spirit. May this prayer help bring you His support! CHECK OUT OUR PODCASTS HERE! Peter’s denial of Jesus during His Passion makes us realize that we need our Lord’s grace and guidance to follow Him, not just our own strength. In the Crowning with Thorns, Our Lord was brutally mocked, yet He is our King, as the Cristeros praised Him centuries later! The Scourging at the Pillar in our Lord’s Passion shows us the dangers and ultimate futility of compromising with serious sins! What might have caused our Lord to sweat blood at Gesthemane? And how can we console Him? Find out the answers to both compelling questions! Does Fasting seem like too big a task this Lent? Or are you not sure what to "give up"? Take heart! God can give you great graces from your penances! The Lenten Season is a special time for renewal as we reflect on our Lord’s Passion and on how best to follow Him and advance spiritually. Hell exists, and we may go there! Yet keeping this dreadful prospect in mind can help us choose blessings instead of curses and keep us on the road to salvation. The Nunc Dimittis is a prayer that pays tribute to Simeon’s recognition of our Lord Jesus Christ as a wonderful light of Divine revelation for us all! A Great Prayer Resource Available in our Web Store!